Update: Don’t use HootSuite – it’s bad for engagement! 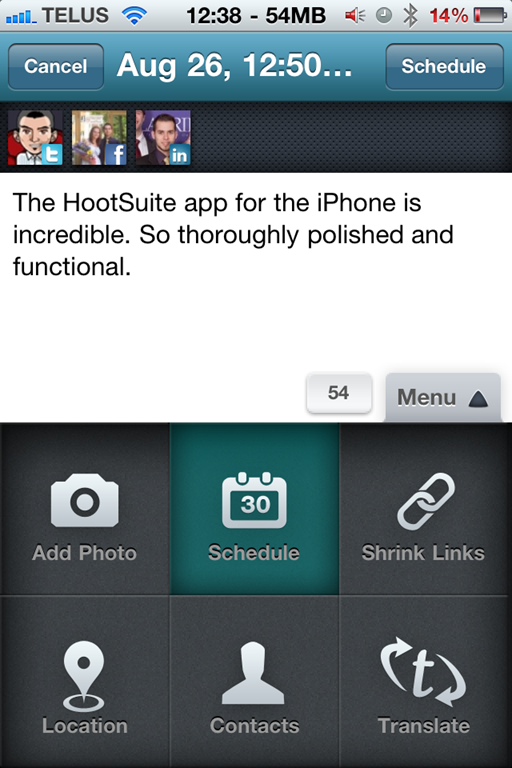 If you are not already using HootSuite, you should be. This nifty little app allows you to simultaneously update multiple social networks at once. There are a number of programs and apps that allow you to do this, but what makes HootSuite special is that you are also able to schedule updates into the future. Find a great article at 2am and want to share it with your friends? Schedule to post it the next day when they are actually awake! Manage social media as part of your job? Find some interesting articles and schedule them to post throughout the week auto-magically. Perfect! The user interface is intuitive and easy to use and the iPhone app is absolutely gorgeous (pictured on the left). It is also completely free so you really have nothing to lose. HootSuite is a necessary addition to anyone’s social media arsenal – social media marketers, that means you.